Are you standing up straight? I have written about this subject in the past but walking in the city yesterday I noticed how many people were walking with what looked like to me, an awkward gait. As a shoe designer and maker, I always pay attention to both the feet and the ankles in others. It is how I see where I can make corrections and help folk have a better, happier walking and dancing life. All shoe designers do that. From behind I saw a number of turned out ankles, very wobbly walkers, seemingly having problems in their heeled shoes. While most of these were caused by wearing heels, I also noticed people with shoes that were too big and not giving any support across the important back of the heel area, it seems to me that less attention is being paid to exactly how you walk as to how you think that you walk. I thought I would focus on some areas where you may have issues that can be helped through using some kind of insole or issues that should demand the attention of a podiatrist or orthopaedic specialist. First, let me look at the two common areas of misaligned walking. Pronation and Supination. The first of two articles will look at Supination. Supination is the natural movement of the foot as it rolls out during the gait cycle. In particular, it is the movement of the subtalar joint (between the talus and calcaneus) into inversion, plantar flexion and adduction. Inversion is where the sole of the foot is turned inwards, plantar flexion is where the foot and toes point downwards and adduction of the ankle involves the toes pointing across the body. Combine all three movements and you have supination. When standing, supination occurs as the foot rolls outwards, placing most of the weight onto the outside of the foot and raising the arch. Supination is a normal part of the gait cycle (walking/running) which allows the foot to form a rigid structure for propulsion. The opposite movement to supination is pronation. Although supination can be part of how you walk or dance when excessive is termed over-supination. As an opposite we can have pronation and over pronation. How problems can occur is when supination and pronation are excessive. I thought I would look at these today. Over supination usually causes over-use type injuries, while these occur most frequently in runners and joggers they are also common in overuse through dance. Over-supination is less common than over-pronation. This can cause challenges for dancers because in over supination the foot is less able to provide natural shock absorption. It can cause further issues to the dancer such as Shin Splints, stress fractures, ankle sprains, ankle strains and plantar issues such as fasciitis, tarsal and metatarsal injuries, fractures of supporting bone structures such as the front leg bone (shinbone or shank bone, is the larger and stronger of the two bones in the leg below the knee, the other being the fibula, and it connects the knee with the ankle bones). Therefore those stresses which are normally absorbed by your feet can be passed up to affect your lower leg. A foot which over-supinates tends to under-pronate. Pronation allows the foot to absorb shock and adapt to the floor (or road). When the foot is over-supinated, the shock absorption of your feet becomes less able to function properly. Over-supination also causes an increased external (lateral) rotation force to be placed on the shin, knee and thigh which places additional stress on the muscles, tendons and ligaments of the lower limb. How do you know if you are over supinating? 1: When standing look at your feet. Is your inside arch very high? 2: Look at your shoes. Are they are worn on the outside of the sole, and at the front of your shoe. 3: Spray some water on your feet outside and walk on a dry paving in your bare feet. A normal foot will leave a print of the heel, connected to the forefoot by a strip approximately half the width of the foot on the outside of the sole If you have problems, the prints of the heel and forefoot will be connected by only a thin strip on the outside, or on an older foot, may not even be connected. 4: Ask someone to look at the back of your legs when walking and see if you and bending outwards with the ankle in a clear curve out. Most podiatrists, physiotherapists, sports therapists and perhaps the more specialist running shoe stores will offer a service called Gait Analysis. This determines whether or not you have over supination or over-pronation as well as regular examples of pronation and supination. For people with considerable over supination, another option is to have an orthotic device or orthotic insole fitted. Orthotics and insoles come in many types and prices. Some are pre-moulded and can be bought off the shelf. These are ok for the majority of problem feet. If your condition is determined to be extreme then that may require your podiatrist, sports injury therapist or foot specialist to make a special cast orthotic which can fit inside your dance shoes. For over supination you need a highly cushioned and flexible insole in your hard shoes to make up for the lack of shock absorption at your foot. While dance is perhaps not the place to start correction therapies you need to correct supination issues in your day to day walking and other pursuits. This is really where insoles come into their own. It’s not easy to put hard insoles in soft shoes although it is slightly easier to fit these into Irish hard shoes and Scottish jigs in Highland. The main place to start wearing corrective insoles are in your normal day to day shoes. Always wear well-fitting shoes and lose the trainers when they stop giving you support. However in very young people, a podiatrist and specialist would rather not use orthotics as the rest of the growing body is still developing so exercise will probably be the solution in this case. We received an enquiry about a dancer with supinated feet having issues with dance shoes. I replied to one dance teacher and my response may be useful to other dancers. I always say that a shoe for dance is something like a suspension bridge. Each part works in a certain way and in tandem or rather in synchronisation with the other parts. Which is why we would not alter the structure of a shoe to correct either pronation or supination as this could create problems in other areas of the shoe. However, we can offer constructive and extremely well-researched solutions. Therefore, in response to this question, I would like to offer you possible solutions to this issue. 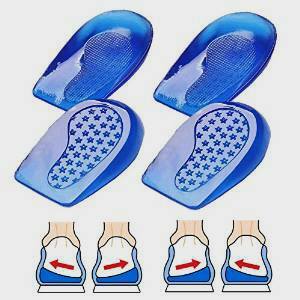 The short answer is that there are insoles that you can buy which help to correct supination. Dr Foot’s Sport Over Supination Insoles • These revolutionary insoles are biomechanically engineered to relieve over supination, forefoot, heel, arch and leg pain. • The Dr Foot Sports Supination Insoles have 2 degree lateral support • Large (U.K shoe size 10-13) (U.S.A shoe size 11-14) • Designed to be trimmed to fit • This is a high-quality performance product which has been tested. Medipaq Posture Correcting Gel Heel Levelling Supports - Angled Design Corrects Pronation or Supination • Help stop back, ankle, knee and hip pain caused by incorrect walking. • The Medipaq soft gel heel cups have a shaped, curved base to hold the heel in alignment as you walk. • This prevents inward or outward rolling, helping to avoid back, ankle, knee and hip pain. • Simply place the corrective posture gel heel cushions into your shoes to help correct inward or outward rolling and provide proper alignment. I have written articles on both pronation and supination and fully understand the issues that either condition can cause dancers and athletes. I also found that some of the major manufacturers of shoe accessories for feet/foot problems make a range of products that are easily available with suggestions from your local chemist, drugstore or running shoe supplier. As dance shoe designers we are dedicated to helping you find possible solutions and answers to issues that may affect your body when dancing but in all cases, you must speak to a professional such as a doctor if and when you believe that you may be having such issues. We are here to offer explanations and help based on that overriding principle.